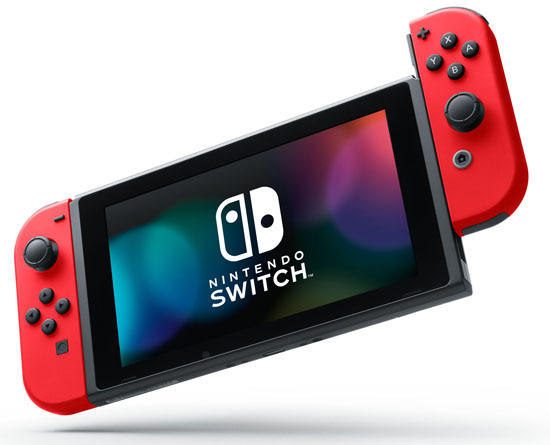 In addition to providing single-player and multiplayer thrills at home, the Nintendo Switch system also enables gamers to play the same title wherever, whenever and with whomever they choose. The mobility of a handheld is now added to the power of a home gaming system to enable unprecedented video game play styles. It uses the Tegra X1, which also powers the Nvidia Shield Android television. The graphics hardware inside the Switch is based on Nvidia's older second-generation Maxwell architecture not the latest Pascal architecture. The two architectures share a similar design however the Switch will miss out on some of the smaller performance improvements made in Pascal. Size: 102mm x 239mm x 13.9mm (with Joy-Con attached) Please note: 28.4mm at the thickest, from the tips of the analogue sticks to the ZL/ZR Button protrusions. System memory: 32 GB Please note: approximately 6.2 GB of internal memory is reserved for use by the system. Video output: Maximum resolution: 1920x1080, 60 fps Please note: output via HDMI cable in TV mode. In tabletop mode and handheld mode, the maximum resolution is 1280x720, which matches the screen resolution. Audio output: Supports linear PCM 5.1ch Please note: output via HDMI cable in TV mode. USB: terminal USB Type-C terminal Used for charging or for connecting to the Nintendo Switch dock. Game card slot: Exclusively for Nintendo Switch game cards. microSD card slot: Compatible with microSD, microSDHC and microSDXC memory cards. Please note: an update via an internet connection is required to use microSDXC memory cards. Please note: the internal battery cannot be removed. If the battery needs to be replaced, a paid replacement via Nintendo Customer Support. Battery life: Battery life can last for more than six hours, but will vary depending on the software and usage conditions. Charging time: 3 hours approx. Please note: this is the time taken to charge while the console is in sleep mode.